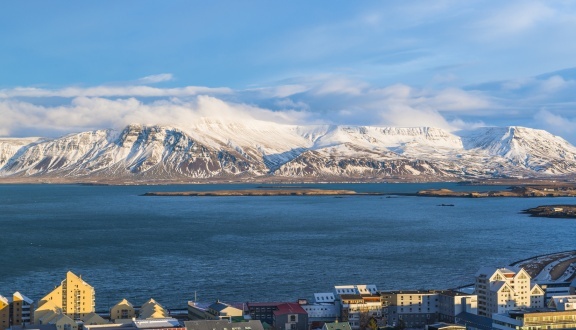 After breakfast, head west toward the Hvalfjordur, also known as Whale Bay. After visiting the tallest waterfall in Iceland, Glymur waterfall, you will enter into the main city, Borgarnes, of the Borgarfjordur district. Learn all about the Saga of the Norsemen settlement in Iceland as you explore the city. Later in the afternoon, continue towards Eldbord crater, the most perfectly shaped crater in Iceland. On the way, you will pass by magnificent scenery as you continue towards Snaefellsness Peninsula. In the morning of the third day it is recommended to have a cruise in the beautiful Bay Breiðafjörður scattered with small islands. The cruise is available in summer and departs from Stykkishólmur. The islands area is known for its great variety of seabirds, including puffins, ducks, cormorants and even eagles. After the cruise, continue to ride west along the northern coast of the peninsula, through the fishermen's village of Rif, Olafsvik, Hellissandur & Grundarfjordur. Explore the Snæfellsjökull volcano that boasts spectacular views. Go for a walk on Djupalonssandur beach and visit picturesque villages in hellnar and Arnarstapi nearby. Later, you will continue over to the Eastern part of Snæfellsness' Southern coast. You may see large colonies of seals in this area in spring time! The next stop will be the Deildartunguhver, Iceland's largest geothermal spring. You will continue to historic site Reykholt, home of the famous poet and researcher Snorri Sturluson. After breakfast, you will continue toward the beautiful waterfalls Hraunfossar and Barnafoss, toward Húsafell, a beautiful resort of bungalows made of wood in a forest of birch trees. You will climb up one of the highest highland roads in Iceland toward the Kaldidalur pass, a dirt road which will take us to the National Park Thingvellir, geologically unique place. Research has made it clear that Þingvellir is a natural wonder on an international scale, the place was recognized by the UNESCO as the World Heritage Site in 2004. Cracks and fissures in the earth's crust can be seen here all over the place. Thingvellir is also one of the most important historical sites in Iceland, it is the establishment site of the world's first parliament Alþingi. After you've seen the beautiful sights of the park you will continue to the other side of the Lake Thingvellir - to the park of geysers and hot springs. You will see the Strokkur - one of the active geysers that erupts every few minutes. 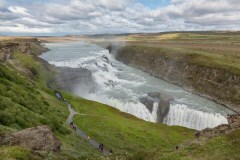 You will continue to the Gullfoss waterfall "Golden waterfall" one of the largest and most impressive waterfalls in Iceland. You'll continue south to see the waterfall Faxi and the volcanic crater Kerið where you will climb up to see the view of the lake harbored in the crater of the mountain. Estimated driving distance: 250 km. Today's activities will begin with a stop at Seljalandsfoss and Skogafoss waterfalls. In the summer, you can walk behind Seljalandsfoss waterfall for a unique perspective of the waterfall! After, visit the museum in Skogar to learn about the history of Icelandics and their lifestyles. You'll continue driving along the southern coast to the Dyrhólaey nature reserve, the southernmost point in Iceland and nesting place for many birds, including puffins. In Reynishverfi you will be able to walk on the beach with black sand and enjoy the view of the cliffs. At the village Vik you'll make a U-turn and go back to Reykjavik. This morning leave Reykjavik and head to the village Hafnarfjörður, famous for its Viking village. You'll cross the Vopnafjörður toward the Reykjanes Peninsula to the Lake Kleifarvatn with the lunar landscape. From here a short drive will take you to Krýsuvík, very geothermal active area with many bubbling mud pools, hot springs and boiling water coming out of cracks in the ground! You will continue on the road that crosses lava fields to fisherman's village Grindavik. Blue Lagoon is located near the village of Grindavík. 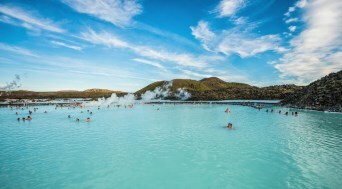 The Blue Lagoon is known worldwide as one of the top ten spas in the world, an exceptional place. We highly recommend to have a relaxing bath in the unique water of the Blue Lagoon before heading back to Reykjavik. Estimated driving distance: 150 km. The day will be spent with a walking tour in Reykjavik before returning the car at Keflavik Airport and boarding your outbound flight home.